MIAMI -- Florida Governor Rick Scott declared a state of emergency Monday to prepare Florida for a possible hit by Hurricane Irma, which strengthened into a Category 4 storm. 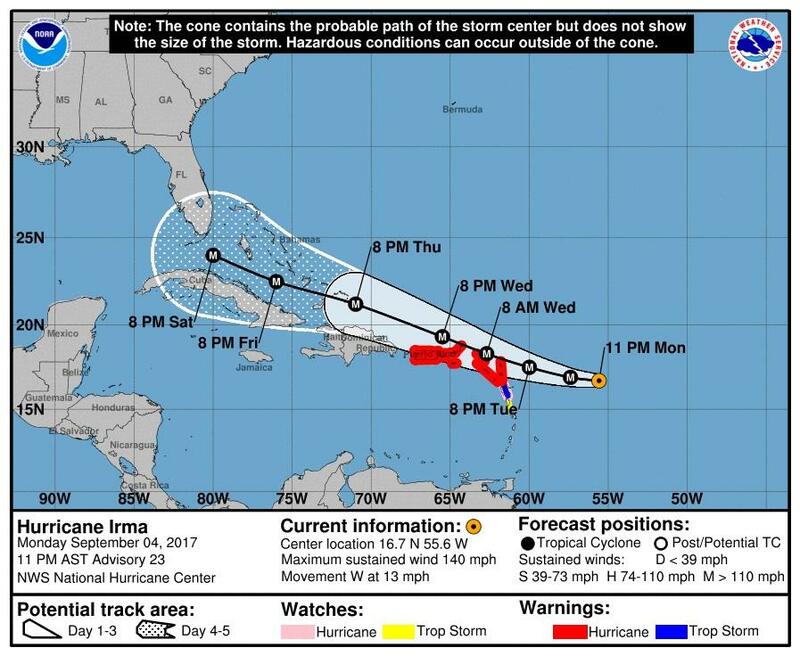 The governor issued the order for all 67 counties in the state soon after the latest advisory showed the forecast cone reaching parts of South Florida sometime during next weekend, CBS Miami reports. "Hurricane Irma is a major and life-threatening storm and Florida must be prepared. I have continued to be briefed by the Florida Division of Emergency Management on Hurricane Irma and current forecast models have Florida in Irma's path -- potentially impacting millions of Floridians," Scott said. I have declared a state of emergency for every FL county to help state, federal and local governments work together as we prepare for #Irma. The order is meant to make sure each local government has enough time and resources to prepare for the dangerous hurricane and keep the community safe. "In Florida, we always prepare for the worst and hope for the best and while the exact path of Irma is not absolutely known at this time, we cannot afford to not be prepared," said Scott. The governor said the declaration of emergency allows for officials to act fast without the "burden of bureaucracy or red tape." Floridians are advised to get prepared for a possible hit by making sure they have an emergency plan and supplies. Scott said they will keep an eye on Hurricane Irma and issue updates as it approaches. I urge all Floridians to remain vigilant and stay alert to local weather and news and visit https://t.co/J875UEWM16 today to get prepared. Late Monday, Gov. Scott tweeted that he had a call with President Trump saying he offered the full resources of the federal government ahead of Hurricane Irma. Just spoke to @POTUS - he offered the full resources of the federal government as Floridians prepare for Hurricane Irma.